Although I have spent quite some time in the vicinity of this restaurant, I never actually managed to pay a visit. 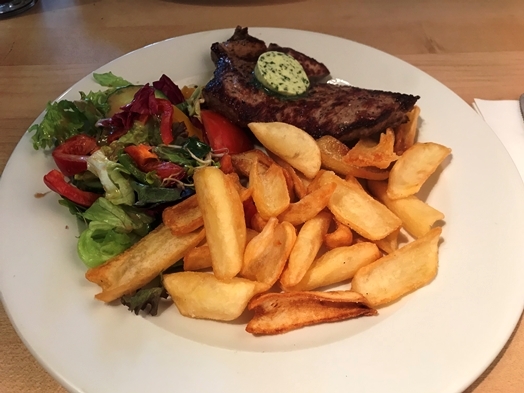 Finally, it was time and I went for the “minute steak of beef, prepared on the grill, served with herb butter, French fries and salad” (EUR 9.40). And the menu even comes with a 0,5l mineral water. Quite a bargain if you ask me. And the dish was surprisingly tasty. Something I definitely had not expected. The place is simple but comfortable – the service is swift and friendly. So, frankly, it is quite a good place to have a quick lunch when you are there. Not that there are many options around that area but it definitely is an acceptable one.